Basix, the extendable base shelf for endcap displays, nearly doubles the capacity for larger merchandise or more inventory in mere seconds. This fully self-contained system needs no extra parts or tools to operate, since no assembly or disassembly is required. Simply lift and pull, or lift and push, to expand or contract the shelf extension. See Basix at the show. Create the look of a perfectly stocked shelf instantly with @Front, Madix’s gravity-feed, roller-shelf system. @Front replaces traditional slip-mat and spring-pusher options, giving you a more efficient, userfriendly solution for auto facing, fronting, and filling your display. When space is minimal, but attracting product attention is important, Madix's Y-Gondola creates a perfect focal point for increased product sales. Constructed entirely from Madix's famous Maxi Line components, assembly is fast and easy. 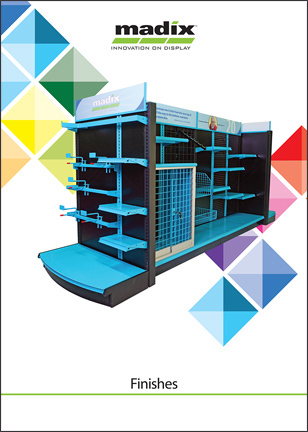 Y-Gondola's innovative design encourages customers to view and interact with highlighted merchandise with ease.